When I first saw trailers for this, I was intrigued and then disappointed.Â What was Liam Neeson doing wasting his talents on a movie like this?Â It was just another blockbuster tent pole movie that the big studios hoped would bring in enough money to keep them solvent.Â Well, my initial reaction was wrong and now you can watch my failure to understand in a brand new format. Starting this May 12th, now available as a two disc extended cut Blu-ray collection from Grive Productions and Twentieth Century Fox Home Entertainment comes the story of a father who will stop at nothing to get his daughter back and is perfectly capable of whatever it takes.Â Taken â€“ Two Disc Extended Cut â€“ Blu-ray Disc is ready to finesse its way right out of your television screen and blast your whole living room away with this story full of chases, explosions, intrigue and good old fashioned fun.Â Bring home this fantastic adventure film which is grounded by solid acting today! Bryan Mills used to work for the CIA.Â He would prevent bad things to happen, as he explains in the film.Â But he retired to spend more time with his daughter who now lives with his ex-wife and her new husband.Â But then, on a trip to Paris, his daughter is kidnapped and Bryan’s threat to the kidnappers is rebuffed.Â Now he is taking names, finding clues and just generally beating up and killing every single person who dares to get in his way.Â But with a 96 hour window to find his daughter, will Bryan be able to follow this chain all the way to the end?Â This movie stars Liam Neeson, Maggie Grace, Leland Orser, Jon Gries, David Warshofsky, Katie Cassidy, Holly Valance and Famke Janssen and was directed by Pierre Morel. The special features included in this two disc extended cut are quite impressive.Â The first disc contains both the theatrical and extended versions of this film, two different optional audio commentaries on the extended cut of the film, a featurette about the making of this film, a look at the premiere of the movie, a black ops field manual and side by side comparison of some of the action sequences and what they did to improve them.Â The second disc contains a bonus digital copy of the film in the extended cut. As I stated above, I wasn’t too excited to watch this movie.Â However, I grew more interested when I learned that both Maggie Grace and Famke Janssen were in it.Â Maggie is great and Famke is the reason that Jane Grey is my favorite X-man of all time.Â Of course, there is also Liam Neeson, who is a screen legend in his own right.Â I now realize it was wrong to write this movie off as just another action flick designed to put people in the seats and get them eating popcorn.Â Although there is little that director Pierre Morel has to say about the world, what he has created is a visually stunning film which relies on timing and flow and dynamic action much in the same way that the classic French action films had.Â It was a style that rose to great relevance during the Cold War and was how most of those movies in the winding, twisting streets with their quick shots and dark heroes were made.Â This hearkens back to those great days of cinema and the result is far more wonderful that I had ever hoped.Â Jason Bourne is the new hero of the film world and gone is the suave James Bond that your father grew up with.Â This movie takes that to the natural conclusion and creates both a stunningly original piece and a compellingly clever homage to the masters of the genre.Â I recommend this film highly. This movie will Take your breath away! 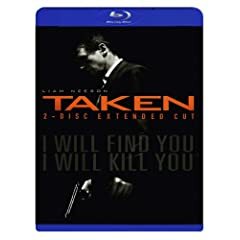 This two disc Blu-ray collection is available at Amazon.com. 1 user commented in " Movie Review: Taken â€“ Two Disc Extended Cut â€“ Blu-ray Disc "